Video conferencing brings the full repertoire of human visual and audible subtleties to a remote meeting to ensure you get the maximum interpersonal interaction including all the non-verbal queues that a simple phone call can never replicate. In addition, the ability to dynamically share rich content amongst all participants and draw additional people in on the fly from any location provides a flexibility and collaboration capability that even face-face meetings cant achieve. The technology gives you a rich, immersive and personalised experience that lowers costs and enhances team productivity. Skype Meetings provide audio, video, and web conferencing on the Internet, with the ability to schedule a meeting in advance or start one at any time. Up to 250 people can join a meeting, using the smartphones, tablets, PCs, phones, and meeting room devices. Join easily with a single touch or click from your calendar, meeting reminder, or the Skype for Business client. Make video a more natural part of everyday business and collaboration, with 1080p resolution, and up to 6 people shown live simultaneously. Focus on the things you’re doing together, even when you’re far apart, with integrated real-time co-authoring, desktop sharing, application sharing, and PowerPoint presentations. Skype for Business Room Systems extend the Skype Meetings experience to meeting rooms, with audio, HD video and content sharing. 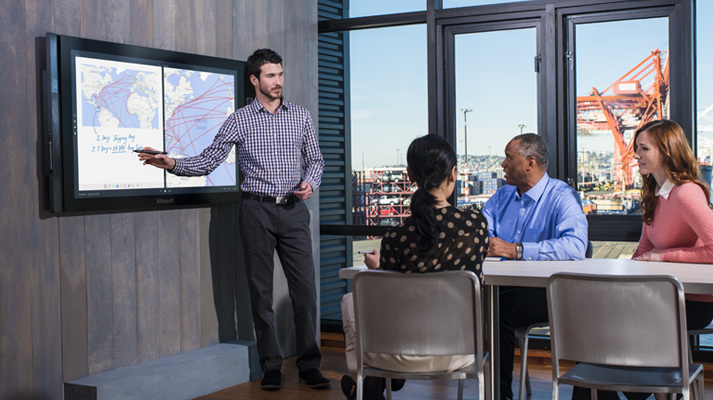 Choose between one and two screen systems from Crestron, Polycom, and SMART, to easily bring remote attendees into meetings spaces of all sizes. Maximise your collaboration experience and reduce your operating costs with cutting-edge Polycom video collaboration. Polycom solutions are optimised for modern workspaces— including huddle rooms and open workspaces as well as traditional conference rooms—all with amazing full HD video, HD content sharing, embedded electronic whiteboard, and full integration with personal and mobile devices. RealPresence Group 310, 500 or 700, combining great video experiences and a new breakthrough simple interface with the broadest interoperability and lowest total cost of ownership of any video collaboration system. Polycom RealConnect for Skype for Business brings together Skype for Business and existing video conferencing environments in a simple workflow, made possible by the Polycom RealPresence Clariti collaboration infrastructure.